In a separate article in which I dispel the rumors that overheating is an infrared sauna danger, I explain that the impetus behind these types of rumors is probably a lack of understanding about infrared technology and how infrared saunas work. Understanding a new type of technology is always difficult, and that's especially true for infrared saunas because they rely so strongly on physics and thermodynamics. They're just completely different than conventional steam saunas. This lack of understanding about infrared saunas sometimes gives rise to skepticism, suspicion and even fear. And those emotions can easily give birth to rumors. So, because many people don't really understand infrared saunas, several rumors are circulating about one form of infrared sauna danger or another. As I mentioned earlier, I address the rumor about overheating being a supposed infrared sauna danger in a separate article. In yet another article in my little series on the supposed dangers of infrared saunas, I discuss the rumor that mineral depletion is one of the risks of infrared sauna sessions. In this article, I'm focusing on how infrared saunas use radiant heat and the way that some people misconstrue this as being a dangerous exposure to radiation. After the so-called risk of overheating, radiation exposure might be the infrared sauna danger that people worry about most. I guess the words "radiant heat" and "radiation" somehow get twisted up in people's minds, even though they are completely unrelated concepts. I'd like to shed a little light on the subject by clarifying the difference between "radiant heat" and "radiation" (in the sense of dangerous atomic or nuclear radiation). Hopefully, I can help some of you be more comfortable about using infrared saunas, because the rumor about this supposed infrared sauna danger is false - they don't expose you to any harmful radiation or radioactivity whatsoever. None. Nada. Zip. Zilch. Okay, then. Here we go. Although it's certainly true that infrared saunas operate by delivering radiant heat to your body, this heat is completely unrelated to dangerous radiation. The radiant heat of an infrared sauna is not generated by a miniature nuclear reactor in the sauna cabin. Unless you live near a nuclear power plant, the closest source of dangerous radiation will be many, many miles away from your home. Infrared saunas are powered by electricity, not radioactive substances like plutonium or uranium. And, to the best of my knowledge (and I've done some pretty extensive research), infrared saunas have no radioactive components, nor any components that are capable of producing radioactivity. So, how could this rumor about the infrared sauna danger of radiation exposure possibly be true? Well, it's not. Radiant heat, although used by infrared saunas, is a concept that is completely unrelated to dangerous radiation. Instead, radiant heat warms an object (in this case, your body) by traveling through the air until it strikes the object (your body). One everyday example of radiant heat at work is the way an outdoor tile or concrete deck will be heated by the rays of the sun. Radiant heating is a completely natural phenomenon that does not involve any dangerous radiation. The rumor about radiation exposure is completely wrong. What is true, however, is that the heaters and lights in an infrared sauna require electrical wiring, and the wiring can generate a minimal electromagnetic field (EMF). This EMF is totally different than the rumored radiation and is not radioactive, but some people who are concerned about the safety of infrared saunas do bring it up. I think it's smart to try to minimize the EMF levels in your home, but people need to remember that every household electrical device involves electrical wiring and will produce an EMF. Even steam saunas have wiring. It's basically impossible to eliminate EMFs from your home altogether, at least if you use any electricity - and who doesn't? If you're not worried about the EMF exposure you receive while reading next to a lamp, you probably shouldn't worry about it in the context of an infrared sauna either. However, if this is something that concerns you, just buy an inexpensive gauss meter on Amazon before you go shopping for your infrared sauna. Then, ask the sauna vendors if they'll let you measure the EMF levels produced by their saunas. You can compare the different models' output and buy one that generates low EMF levels. This strategy will prevent you from exposing yourself to more EMF than is necessary. 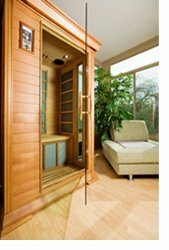 You'll be able to relax in your infrared sauna knowing that you're safe from two types of rumored infrared sauna danger - radiation exposure and EMFs.